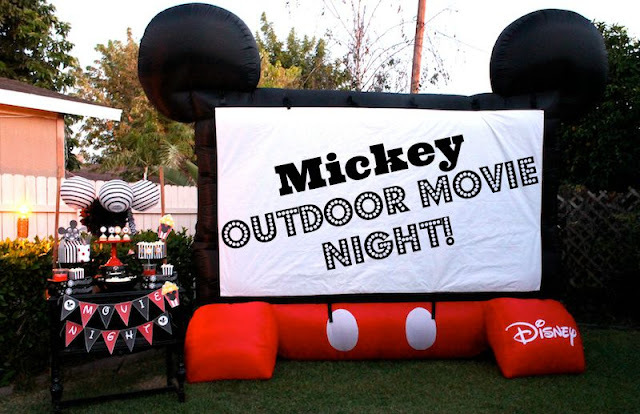 Mickey Outdoor Movie Night + FREE printables! Summer is almost coming to an end, and for us, the first day of school is right around the corner. Our Mickey outdoor movie night was just what the family needed, to squeeze out the last bit of Summer fun! We have watched countless movies outside this Summer, and it has been great! (click to see our Teen Beach 2 outdoor movie party) We light our tiki torches to create a soft glow of light. My children enjoy the calming ambiance, and I love that the torches keep any flying pests away! For our Mickey outdoor movie night, I kept my color palette in true Mickey colors: Red, Black, and Yellow. I added some fun stripes, polka dots, and incorporated a Mickey movie reel, and some Mickey popcorn printables! Movie snacks are a must! I served popcorn, and punch. We were all still full from dinner, so our snacking was kept to a minimum. I jumped at the chance to use our Mickey shaped bowls! I found these a few years ago, while shopping at Target. Mini cupcakes were topped with Mickey-themed circle toppers, and finished off with polka dotted cupcake wrappers. I set out popcorn & drinks inside of fun movie snack trays, from Oriental Trading. Polka dots are one of my favorites! Just Add Glitter By Marla created a fun painted mason jar that held our black & white paper straws, perfectly. Themed movie nights are always fun, and I try to keep my outdoor movie set up simple. Sometimes my children bring out a huge blanket to lay on, or even some throw pillows. Towels, or chairs... it all works! On this particular night, we set out pillows, with coordinating pillow cases. Our Mickey Pillow Pet wanted to enjoy our outdoor movie night as well. I displayed small boxes of popcorn on a cake stand. Having snacks already prepared & set out, made for easy grabbing. I added some circle toppers that I created, to the front of the popcorn boxes. I'm also sharing these printables as a free download! We recently purchased this inflatable Mickey Mouse outdoor movie screen. Isn't it darling?! I found it online at Walmart. I can't tell you enough, how much we love it. It's so easy to set up, which is probably why we've had an outdoor movie night, at least once every week, for the past month. My boys get so excited when they hear the fans start to inflate the screen. And don't forget your Mickey ears! My boys love wearing their Mickey ears! We really love getting into the Disney spirit whenever possible! Our 'movie night' banner added a bit more color, and a little more fun to our Mickey snack bar. The movie snacks were a hit, and super easy to throw together. Are you ready to enjoy an outdoor movie?! I hope we've inspired you to create your own Mickey movie night! To help get you started, I'm sharing all the printables, as a free download! Updated from original post - March 2017. 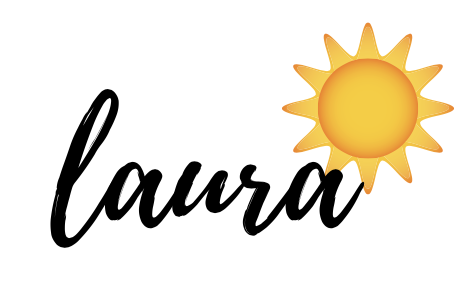 I would like to personally congratulate you as your blog LAURA'S little PARTY has been selected by our panelist as one of the Top 75 Party Blogs on the web. I personally give you a high-five and want to thank you for your contribution to this world. This is the most comprehensive list of Top 75 Party Blogs on the internet and I’m honored to have you as part of this!